This guide serves faculty, staff, and students in improving and supporting instruction and learning in various learning environments (e.g., face-to-face, hybrid, and fully online). This represents our effort to share our knowledge with you. Students who want to receive accommodations for disabilities should call 251-380-3470 (or email casa@shc.edu) to set up an appointment as soon as possible so that warranted accommodations can be arranged. Support services and staff for students with disabilities are housed within the Center for Academic Support and Advising on campus. In Schoology, instructors can assign tasks or tests to individuals when they create them. 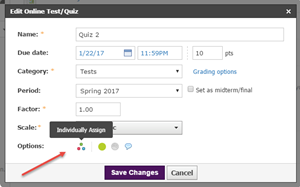 Instructors can also reuse existing assignment or test by saving it to Personal Resources in Schoology. Then bring it back into your course as a new test with a different name. We suggest naming it with "Extended Time" in the title, so students know they're receiving the recommended time. Next, go to test settings and add the prescribed accommodations. Warning: Don't reassign the mainstream test to an individual in Schoology, as it will disappear the test scores of the other students. Instead, instructors should make a separate assignment or test for the student(s) that need accommodations. See image below to locate the option for individually assigning a test to a student. This option is available when editing the overall test from the settings wheel. See how-to guide for providing accommodations within online courses below. For more information, contact Dr. Rogers (x4480). The Voluntary Product Accessibility Template (VPAT) provides information on Schoology's accessibility per feature/function. This covers the tasks (assignments, discussions, & tests) in our learning management system, Schoology. The following textbook and software publishers' products are used on campus. Each offers alternative text files and/or accessible eBooks for persons with that type of accommodation for their disability, granted that they have purchased the textbook. Select the link to the textbook publisher used in your course to find out more. If you have a student in need of one of these modified products, contact the SHC Coordinator of Academic Support, Beca Venter-Lombardo (rventerlombardo@shc.edu), to obtain it on their behalf. If you're using a different publisher, let Dr. Rogers (srogers@shc.edu) know, so she can update this list. The College is a Google Apps for Education school. We use Gmail and within it, we have access to numerous G Suite tools (apps) such as Google Docs, Sheets, Slides, as well as creating Google Sites or our own YouTube channels. Here's the link about Google's products accessibility features. See the G Suite tab on this LibGuide for more information. SHC provides Office 365 free to faculty, staff, and students. They offer inclusive features and accommodating tools in their suite of tools. Word: Instructors are able to determine the accessibility of their Word documents with the Accessibility Checker built-in feature under the Review tab. For students using screen readers, Microsoft has made it easier for them to access the editing tools with short-cut keys. PowerPoint: Office incorporates machine learning to produce intelligent alternative text for images you add to PowerPoint. This new feature provides a specific description of the image for a person with limited vision. You can accept or reject the machine produced description, as they populate. Another aspect of inclusive design is the Recent Items list when you add a hyperlink. It will provide an accessible hyperlink with a proper name if you searched for it recently. Also, PowerPoint now has accessible templates to choose from. These should be used all the time to prepare for any student who might need to use a screen reader as their accommodation. For more general information, see link for Accessibility in Office 365. For students with disabilities, see the various guides for accessibility features in Microsoft products. Learn how to create accessible portable document formats (PDFs) from the get-go! You can use this same information to convert PowerPoints to PDFs, too. An online workshop on accessible course design is now available in Schoology. Dr. Rogers (srogers@shc.edu) is the developer and moderator. Contact her to be added to the self-paced, six lesson workshop. Accommodations: Prescribed modifications to a learner's learning and testing environment based on a certified mental, physical, and/or emotional limitation. These modifications include auxiliary aids, services, and effective communications. ADA: The Americans with Disabilities Act (1990; ADA Amendments Act, 2008) includes guidelines for online learning. Visit the ADA Website for more information. Closed captions: Captions are visible text that has been synched with media. Closed captions (CC) can be turned on and off. Open captions are always on. CC is a best practice for universal design in that if they distract the viewer who doesn't need them, they can be turned off. JAWS: Job Access With Speech (JAWS) is a commonly used screen reader software program developed by Microsoft for Windows' computer operating system. OCR: Optimal character reader (OCR) software renders scanned PDFs, which is a scanned image and not really a PDF, readable with assistive technologies like text-to-speech. Adobe Acrobat Pro XI can render your scanned PDF readable (turn photo of words into readable words). PDF: Portable document format (PDF) created by Adobe publisher for the Web. Sans-serif fonts: Fonts that do not have “hats and shoes”, that's the base or top lines added to serif font styling. For example, Arial is a sans serif font because of its simple style that's easy to read online. Section 504 (1973): The US Department of Labor outlined the rules for federally funded institutions to not discriminate against individuals with disabilities in any way in Section 504 of the Rehabilitation Act. Section 508 (2015): These are the federal guidelines for electronic and information technology to follow so that websites and software used are interoperable with assistive technology. Screen readers: According to Wikipedia, it's a software application that attempts to identify and interpret what is being displayed on the screen. It’s a type of adaptive technology for the visually impaired. UDL: Universal Design refers to the consideration of the needs of persons with disabilities in regards to physical spaces and objects. Universal Design for Learning (UDL) recognizes those needs for course design. Its main premise is equal access to education and extends this to all types of learners and not just those with disabilities. The Principles of Universal Design are equitable use, the flexibility of use, simple and intuitive use, perceptible information, tolerance for error, low physical effort, and size and space for appropriate use. The Center for Universal Design (1997). The Principles of Universal Design, Version 2.0. Raleigh, NC: North Carolina State University. This creative menu of learning activities that incorporate universal design was created by Dr. Thomas J. Tobin (2017). Do-it-yourself checklists are provided below. Let us know if you have any questions. Sandra (x4480) can review your online course for accessibility issues. Web Accessibility in Mind (WebAIM) provides a Section 508 checklist to meet the requirements of the Rehabilitation Act (1990). WebAim's Web Content Accessibility Guidelines (WCAG) checklist provides guidelines for Website developers. You have access to the latest version of Adobe Acrobat Pro XI in the Faculty Development Center, which is located in BL112. Use Adobe Acrobat to bring new life to old PDFs (e.g., right them if they were photocopied askew), combine Word Docs and other PDFs into a single PDF, add fillable blanks to forms, and edit existing PDFs. It also can render a PDF with the accessibility features required by the Americans with Disability Act (ADA). For example, it renders a scanned document (photo of article) readable by rendering it with optimal character recognition (OCR), so persons with visual impairments can have it read to them with assistive technology. 1. Captioning Key is funded by the National Association of the Deaf and The Described and Captioned and Media Program. It provides a PDF document on specific quality assurance guidelines for closed-captioning. 2. Amara.org for captioning any video on the Internet. 3.YouTube automatically captions the videos you upload. Most instructors at SHC are using an unlisted YouTube Channel to share their lectures with students in online courses. Just ask the eLeaders, Dr. Carmody and Fr. Viscardi, how to do this! YouTube's captioning services isn't always correct. See Dr. Rogers' video tutorial on how to correct the automated captions on YouTube. First, you'll need to create your YouTube channel. See the how-to guide below. Use YouTube to caption and share your video lectures with students online with an unlisted channel that only those with the link can view.